Well, it took me WAY too long to buy this book, for which I can only offer my profuse apologies to the author. I had wanted to do a review while the book was still in stores, but October escaped me. Obviously, November did, too. Before I tell you about this book, I think I will remind you about my review policies and admit that yes, I know the author and consider her a friend. That has nothing whatsoever to do with the nature of my reviews. I do not hold punches. If I’m uncomfortable posting a favorable review on this blog, I won’t do it. I also try to be honest about likes and dislikes. It speaks volumes for “Dragon” that you won’t find any mention of “dislikes” below. So, I’m almost two months late, but the book was worth the wait. 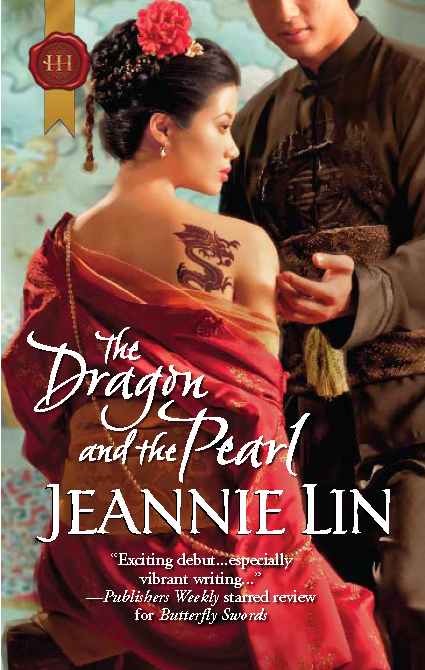 “The Dragon and the Pearl “ is a stand-alone novel by Jeannie Lin, however it does pick up where “Butterfly Swords” left off. “Dragon’s” cast includes Li Tao, the antagonist of Butterfly Swords, as the hero of “Dragon,” and his backstory gives us a much wider vision of the author’s Tang Dynasty China. Now I loved “Butterfly Swords” (click the link to see my review), but you can see Lin’s skill as an author has increased since the first book. She has sunk herself into this world, making the characters rounded, fleshed and highly sexual. More than that, her political and social structure is more solid than the Kunlun mountains. She needed that solidity as we find out how both the court and the seedy underground culture of Tang dynasty functioned. Thanks to that background structure, we discover why Li Tao is the stern and unyielding man you met before, but we also find the heart beneath that exterior. That said, he never breaks character. His is one of the strongest, most well rounded characterizations I’ve ever seen. Hypnotizing, never a good man, but always a believable and desirable man. In many ways, Lin’s characterizations and dialogue reminded me of works by my favorite author, Guy Gavriel Kay. Those of you who know me will recognize I mean that as the greatest compliment I can give. If you enjoyed the dainty appetizer of “Butterfly Swords,” you will love the full course spread that is “The Dragon and the Pearl.” Go out and buy a copy via Amazon, Barnes and Noble or wherever else you can find one OR you can put your name into the hat for this second copy I bought. I refuse to give away mine.